In this picture, me and a bunch of other Mounties are at Buckeyethon. Here, we raised money to end pediatric cancer. It meant a lot to me because one of my favorite campers from 4-H camp just recently was diagnosed for a second time. 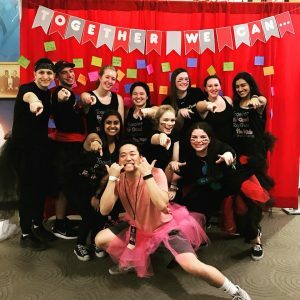 It hit me really hard so doing Buckeyethon was a big deal for me. Hanging out with these people was so much fun! I never hang out with the few people that stayed the whole time with me, but for those 12 hours we were like best friends. It was so fun and such an amazing, rewarding experience. I had such a good time with my fellow Mounties. We danced, exercised, made tutus, played laser tag, and silent discoed the night away! It was such a good time and I can’t wait to raise the money again next year so that I can dance again! Posted by Jennifer Sizemore at 2:04am Posted in Artifacts. Bookmark the permalink.